This is a crazy feat for an animated TV show that has spanned over TWO decades! The animated comedy is in its 23rd season, making it the longest-running primetime scripted programme on US TV, an amazing feat to say the least and it must be respsected. It also has been confirmed and contracted to do another 2 seasons; thats another 59 episodes from this last episode of release making it a staggering 559 episodes and probably taking it to its 23rd year anniversey. The episode guest stars non other than Wiki Leaks founder Julian Assange, which at the time of it being aired in the UK is actually hilarious! The episode is all based on Springfield finally kicking out the Simpsons from the town after all the problems and money they have caused Springfield to lose and how the towns people have finally had enough. With that being said, it soon spirals into a funny tale of the Simspons living in the outback making ends meat with just what is around them and living next door to none other than Wiki Leaks founder Julian Assange. They make some funny lines as well about the kind of house he lives in and if it is safe enough for him. It moves onto Lenny first making the move in to the outland to re join Homer as he misses him which is soon followed by Carl. They are sat having home made beer Homer made and Moe turns in a predictable Moes Cavern bar he made expecting Homer and pals to come by and drink beer there. Bit of a silly few minutes happen, and the next minute everyone in Springfield has moved to the Outland and starts building a new Springfield, which funnily enough see's the departing of Julian Assange. So how do you rate a Simpson's epsiode after 499 predecessors have done pretty much everything i can think of? Well lets put it down as a rating out of 10 for starts. In my opinion due to it's sheer number of viewers and such prestige in prime time ratings, it has to be a minimun 5 out of 10. However, in terms of creativity with this episode, they could of done so much more, how about making this into a nother 2 part episode, another to be continued. We have not had one of those in the Simpson's since Who Shot Mr Burns? episode's in 1995. Had an easy place to bring that back in to celebrates it's 500th episode and tell the story a bit more. As usual this episode felt like it was being forced to be written into a 25 minute time gap and missed alot of potential good scripting. It had it's standard 10 minutes of comedy gold which is a custom in the newer Simpson's episodes and alot more questionable story directions too. Overall it has probably been one of the better episodes of this seasons batch, but still not a patch from an episode in it's prime. It's hard for me to believe enough people watch the Simpsons to justify it still being on the air. I personally don't know anyone who still watches it. Yay Simpsons! I grew up watching this crap after school, it was on at 5 and 5:30, double dose! I have to say though, it's not really an achievement. It's just something that happened. At this point the Simpsons doesn't have to put any effort into keeping seasons going, it's an executive decision, because they know they can sell ad-space. Unfortunately everything in this world comes back to money. The fact that we got past episode 200 has nothing to do with the quality of the show, as others will testify to, it has lost it's appeal, perhaps because it's not fresh, perhaps because it has actually gone down hill. It doesn't matter if the Simpsons is objectively good, it comes down to perception. I'll drink to the 1000th episode though! Here's to capitalism! Btw, simpsons has been around since 1989...its well past its 15th anniversary. Simpsons has become an awful show. I'll occasionally watch an episode now and then, and I just don't laugh anymore. I just sit there stonefaced until the episode is over. 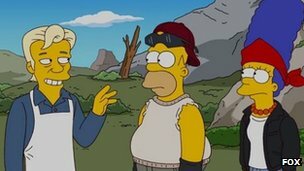 There's no substance or intelligence to the humour anymore, the show has basically become, "how stupid can we make Homer look," or some sort of celebrity guest star gag. The show ran it's course a long time ago. There's something to be said about finding the right time to gracefully bring a show to its end and, unfortunately, Simpsons missed that opportunity long ago. The last 10 or so seasons have been awful, and I wouldn't shed a tear if it ended today and would instead say good riddance. Early few years of Simpsons were awesome ive never watched it past that :/ Once i tuned in few years ago and the episode was kinda bad. I hate the new Simpsons with a passion. What once was a show that had a political statement and brought us Europeans a bit of the Land of the Free with a very sarcastic spin and sometimes surprisingly subtle humor is now just making fun of a fat retard and his dysfunctional family. This sums it up perfectly, honestly. The first 7 seasons were gold. After that, it just became more and more garbage. But hey, if you can attract a similar amount of viewers while giving a fraction of the effort that you used to, go for it I say. Easy doesnt fit into grownup life. Would you guys say the same about Family Guy? Seems to be the same gag over and over again sometimes >< it might be marginally better though. Ugh. Better if you like "like that one time [somebody did something incredibly stupid and random]" jokes for half an hour. Plain retarded. American Dad is better. Its sad to see what the Simpsons has become. It really should have ended a couple seasons ago. Think personally it should end with another Movie, but then again with all the "meh Simpsons'" in here, i doubt it would be as big as a success as the first one was. Quit when it's best, so people will always remember and admire your work. Some shows age like wine, some like cheese and the Simpsons have become a fetid, rotted blob of a once delicious Müritzer. Does anybody else get that weird feeling that they will talk about or think about a Simpson episode and then it will be on air a few days later? Anyone? EDIT: to add, I agree with most of the sentiments expressed here about Simpsons getting worse and worse. I used to enjoy it for the satire and political commentary, but I almost feel as if they saw how much people liked Peter Griffin and tried to emulate him. Happens to me with several shows. Yay! Someone else! I don't feel like I have the world's worst superpower now.